Ever wonder about Columbia's exciting historical newspapers collection? So much journalism history is right at your fingertips, including titles like The (New York) Sun from which the famous declaration to eight-year-old Virginia O'Hanlon was written in 1897. You can find this letter to the editor in The Sun in the Rare Book & Manuscript Library, but that's only the beginning! We have many digitized historical newspapers through ProQuest Historical Newspapers, Gale NewsVault, Archive of Americana, and more. Enjoy some history this holiday season! This entry was posted in Newspapers - Historical and tagged cool stuff, Newspapers on December 11, 2012 by Cris. 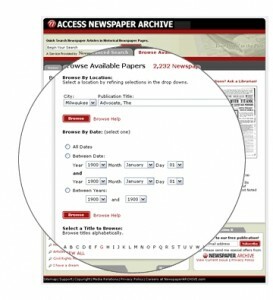 NewspaperARCHIVE database has been added to Columbia’s online newspaper collections. This resource contains tens of millions of searchable historical newspaper pages, dating back to the 1700s, from across the globe. This entry was posted in Columbia University Libraries, Electronic Resources, Newspapers, Newspapers - Historical and tagged Newspapers on January 4, 2011 by Cris. This collection continues to update on a monthly basis until its completion in late 2010. This entry was posted in Columbia University Libraries, Electronic Resources, Newspapers, Newspapers - Historical and tagged Newspapers on February 17, 2010 by Cris. Looking for a state-by-state list of all American newspapers available at Columbia University Libraries? This comprehensive list, arranged by state and city of publication, is a great place to start! It includes currently received paper issues, newspapers in microform, and newspapers available through our online database subscriptions. All call numbers (F, FA, FN, etc.) refer to the Microform Reading Room, 401 Butler Library. This entry was posted in Beat Reporting, Cheat Sheets & Guides, Columbia University Libraries, Ethnic Press, Newspapers, Newspapers - Historical, Research Tips and tagged Newspapers on January 8, 2010 by Cris. The online New York Review of Books includes full access to the archives, back to 1963! http://www.columbia.edu/cgi-bin/cul/resolve?clio5577883 (access restricted to current Columbia affiliates). Click on the “Archives” link at the top to access older contents, or browse the current issue from the main screen. This entry was posted in Columbia University Libraries, Electronic Resources, Literary Journalism, Newspapers - Historical and tagged ebooks on August 4, 2009 by Cris. ProQuest Historical Newspapers (access restricted to current Columbia affiliates) has become a mother lode for U.S. newspapers. The database, which started with the New York Times and Wall Street Journal backfiles, now also includes historical coverage of the Atlanta Constitution, Boston Globe, Chicago Tribune, Los Angeles Times, and Washington Post. 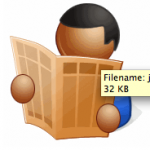 The source of the database is microfilm, so you display articles as they appeared in the paper, and can even flip through the pages of an entire issue. The Times Digital Archive (access restricted to current Columbia affiliates) provides image access to the Times of London. Accessible Archives (access restricted to current Columbia affiliates) is a searchable plain-text collection of early U.S. papers, including the Pennsylvania Gazette, the abolitionist newspaper The Liberator, and a collection of 19th century African-American newspapers. A great free historical newspaper on the web, of local interest, is the Brooklyn Daily Eagle, brought to you by the Brooklyn Public Library. It is a searchable, page image collection of the Brooklyn paper from 1841-1902. This entry was posted in Electronic Resources, Ethnic Press, Newspapers - Historical, NYC, Research Tips on July 28, 2009 by Cris.